Uncharted: The Lost Legacy is an easy video game to like in spite of its flaws. It’s buoyed by a winning cast of characters and has some of the prettiest vistas this side of an actual trip to India. It also includes one of the most entertaining hidden features I’ve ever encountered in a video game. This review originally appeared 8/17/17. “Photo modes” like this aren’t new to video games. Nor is the ability to choose your character’s facial expression after freezing the frame, which the PS4’s Horizon Zero Dawn had patched in a few months after launch. But Lost Legacy is the first game I’ve played that gives me the ability to pause the action—even in the most dramatic moment of the most dramatic cutscene—and have my character make a stupid winky-face. Words cannot properly express how much I love it. 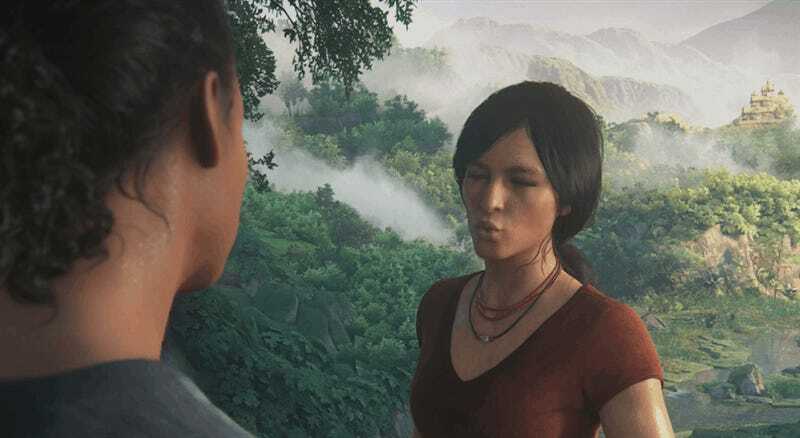 As soon as I realized it was possible, I set out to capture protagonist Chloe Frazer making a stupid winky-face in as many unlikely situations as possible. Lost Legacy is for the most part an interactive action movie about treasure hunters in the Indian wilderness. Developer Naughty Dog’s approach to game design can be thrilling at its best and tedious at its worst. But of all the generally limited interactions the game allows—shoot, climb, jump, sneak—its photo mode is the most beguiling and consistently entertaining. Enter photo mode in the midst of a cutscene and Chloe’s face will snap to a different expression. Exit photo mode and she’ll snap back to her scripted expression, as if the bones and muscles of an actor’s face have actually, physically rearranged. What a marvelous feat of technology! What creepy foreshadowing for the future of film! (Oh, for the day that Pixar decides to include such a feature in their movies.) I don’t know where this wonderful widget may go from here, I just know that it brought me as much entertainment as the rest of a plenty entertaining game. 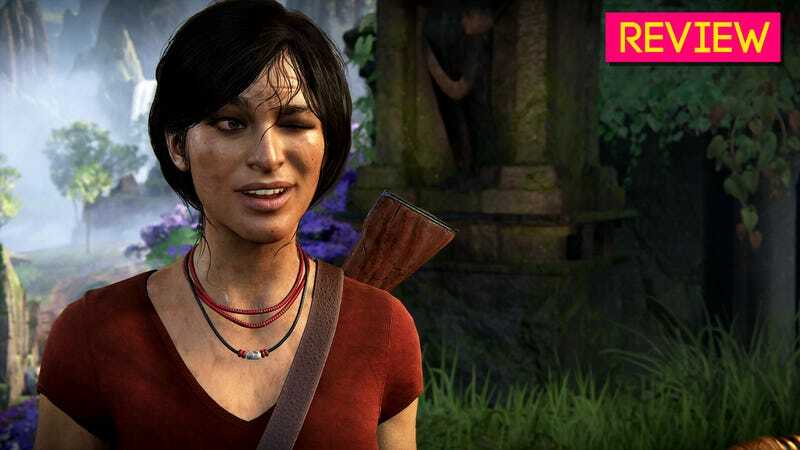 Uncharted: The Lost Legacy stars Chloe Frazer, a mercurial treasure hunter best known for her likable supporting role in 2009’s Uncharted 2: Among Thieves. She subsequently made a brief appearance in Uncharted 3 and was missing in action for the entirety of Uncharted 4. Chloe has always been a fan favorite, an underdeveloped enigma given just enough depth by actor Claudia Black’s charismatic performance to make you wonder what her deal really was. Lost Legacy aims to answer that question. Viewed from a distance, Lost Legacy’s story is straightforward to a fault. It never strays beyond territory well-covered by previous Uncharted games or other similar genre fiction. If you’ve played one of these games or even just watched an Indiana Jones movie, you’ve seen every trick Lost Legacy has up its sleeve. It’s got unlikely partnerships, secret family histories, dad stuff, lost civilizations, friendships under stress, and so on. Fortunately the specifics fare better than the generalities, and several well-written characters and well-conceived action sequences stand out against the overly familiar backdrop. If a game must adhere to a formula, let that formula include brisk dialogue, showstopping set-pieces and magnificent art direction. Chloe is attempting to recover “The Tusk of Ganesha,” an ancient artifact of the Hoysala Empire rumored to be hidden somewhere in the wilds of western India. It will not shock you to hear she’s competing with a power-mad warlord who also wants the tusk, nor that she’s entered into an unsteady alliance with a mercenary—Uncharted 4 co-antagonist Nadine Ross—in order to achieve her goal. Your non-surprise will deepen when you hear that Chloe spends the game sneaking through patrols of armed guards, sprinting through scripted chase sequences, tumbling from ledges that just happen to break when she touches them, and looping her grappling hook around dozens of conveniently placed tree branches. If you’re looking for a glossy action game to entertain you for ten or so hours, Lost Legacy fits the bill. If you’re looking for a brilliant third person shooter, or a challenging platforming game, or a collection of satisfying puzzles to solve, you can find better options elsewhere. Lost Legacy does little to address the many mechanical misgivings I’ve come to have about Uncharted games over the years. Like its predecessors, it is fun to look at, but not always all that fun to play. The source of most of my gripes can be traced back to a certain floppiness that’s manifested in Uncharted games since the first one came out in 2007. Call it what you want—game-feel, the rhythm of play, sticky friction—it’s the way the game responds when you press a button and watch your character do something on screen. Whether Chloe is climbing the face of a massive statue, shooting at bad guys, or fleeing an armored vehicle, her actions stretch and elongate as if the world she occupies only passingly obeys the laws of physics. Jump, and her momentum will mysteriously slow in mid-air as she stops short and drops to the nearest handhold. Swing on a rope, and the camera will shake and judder as it struggles to snap her toward a convenient landing point. It’s as if Chloe moves through the world surrounded by a force-field that, on a slight delay, reshapes her trajectory according to a pre-written script. Which, of course, is more or less what’s happening. Lost Legacy shamelessly softens the laws of physics in service to a rigid overall design. Most of the platforming sections feel less like dizzying tests of timing and more like what they are: predetermined pathways from point A to point B. During one of several signature Uncharted cinematic chase sequences, I felt less like an adventurer sprinting across a collapsing bridge and more like an actor hoping to hit her marks. Each time I died I felt frustrated not for getting Chloe killed, but for ruining the take. It didn’t help that every chase sequence was punctuated by invisible enemies peppering Chloe with gunfire. I get it, game! I’m supposed to hurry! Please stop shooting me. When Chloe isn’t running or climbing, she’s usually fighting. Most combat encounters begin with some sneaking, as Chloe and Nadine skirt their enemy’s perimeter and take down stray guards. Lost Legacy introduces silenced pistols as an optional weapon type, which adds the potential for ranged stealth kills to Uncharted 4's melee-only stealth. It seems like a game-changer at first, but you have to find one to use one, and once its ammo runs out—which it will—you’ll have to pick up something louder. Enemy artificial intelligence is dim on the whole, and with no “whistle” or rock-toss, there’s no way to quietly manipulate guards into or out of your path. Instead you just wait in the grass for a guard to pass by, then take him down and wait for the next one. …and yes, my favorite part of the stealth sections was that they gave me the opportunity to strike humorous poses with the guards I was choking out. When gunfire inevitably breaks out, things feel appropriately chaotic, if frustratingly imprecise. Lost Legacy’s gunplay suits the game’s purposes well enough but fails to match the precision or positional strategy of other, more satisfying third-person games. When I’m in cover and want to pop out to shoot at a bad guy, I invariably come out with my gun aimed too far to his left or right, frantically wheeling my aim toward my target while spraying bullets every which-way. I could find no option to turn on a persistent reticle to line up my shot before aiming, even though such a reticle exists in multiplayer. As a result I spend more time standing up and aiming than I otherwise would, which leaves me open to enemy fire. It gives gunfights a scrappy, improvisational feel that can be exciting, but often left me cursing myself for not being a better shot. Lost Legacy deviates notably from the established Uncharted 4 formula during its second act, which takes place within an unusually large, open area. Armed with a map straight out of Far Cry and a jeep straight out of Uncharted 4’s Madagascar chapters, Chloe and Nadine solve puzzles hidden within a variety of ancient structures strewn about the region. They’re also free to tackle a handful of optional side challenges that only the most pressed-for-time gamer would choose to skip. That second act is reminiscent of the sprawling, interlocking puzzle-regions from 2008’s underrated Tomb Raider: Underworld, though none of Naughty Dog’s puzzles are as complex as the ones Lara Croft solved almost a decade ago. Most of the puzzles you find after reaching a destination are simple tile-shifting deals. Rather than helping you unlock a part of a larger puzzle, each just brings you one step closer to opening a big cliffside door and moving on to the next act. The individual components aren’t that exciting in isolation, but the open-ended structure is a pleasant respite from the linearity of the rest of the game. Uncharted puzzles have rarely done much for me, and Lost Legacy makes little progress in that department. The confusing nature of the puzzles is actually an example of one way in which the game’s stunning fidelity works counter to its gameplay goals. Be it a rotating tile mosaic or a massive, room-sized shadow perspective puzzle, I often felt I was too deep “inside” an immaculately rendered contraption to sort through all the variables and logically arrive at a solution. I would either immediately spot the solution or simply move pieces around until, after a few minutes, I arrived at one. Professor Layton, this ain’t. Yet for all my gripes about Lost Legacy’s platforming, stealth, combat, and puzzles, I still found it to be an endearing, entertaining game. Part of that is thanks to its focus and pacing. Absent the globe-trotting exploits of the main Uncharted sequels, Lost Legacy is freed up to tell a story that follows a clear geographic trajectory and feels more focused as a result. Each sequence flows naturally into the next one, with exploration gracefully transitioning to puzzle solving before leaping into combat and relaxing back into exploration. I never felt stuck or frustrated, nor did any individual sequence wear out its welcome. It all builds to a tremendous, wham-bang grand finale that plays out like a giddy greatest hits collection from past Uncharted games. Like its predecessor, Lost Legacy is one of the most gorgeous video games I’ve ever seen. Ruins have never looked so grand, peeking as they do from beneath green canopies; subterranean statues have never loomed so menacingly. I love the included photo mode because it lets me make goofy faces, but I also love it because of how it helps me enshrine the astonishing work of Naughty Dog’s artists. At various points Chloe will get an optional prompt to take out her phone and snap a picture. By the end of the game you’ll have a nice library of shots to revisit, albeit in much lower resolution than the actual screenshots you can snap with your PS4. It’s a curious feature to work into a game like this one, but a nice way for the characters to acknowledge their beautiful surroundings. I’ve always liked it when Uncharted characters reference the superhuman stunts they so routinely pull off; why not have them remark on the beauty they discover, too? The story may be the stuff of airport paperbacks, but it’s the good kind of airport paperback, where the chapters float by and you feel refreshed, if unchallenged, after turning the final page. More so than in past Uncharted games, the writers poke fun at series tropes, and an enjoyable vein of arch meta-humor runs through the script. The jokes land more consistently than the more earnest attempts to explore how Chloe reconciles her half-Indian heritage with the fact that she’s plundering Indian historical ruins, but she does reach a satisfying if clichéd denouément in the end. 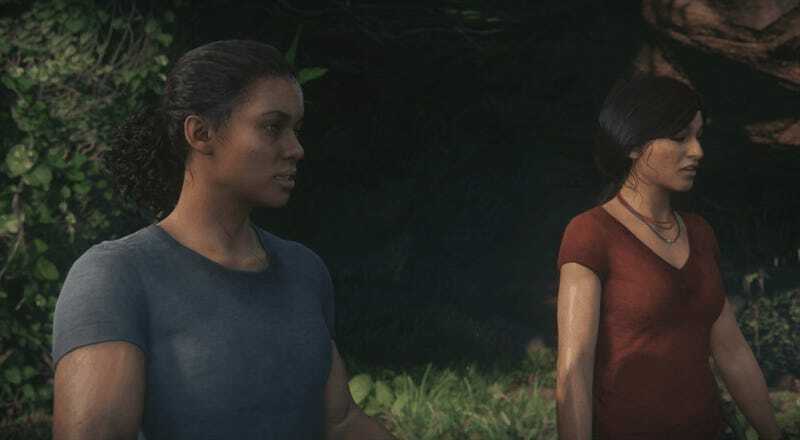 More consistent is the writers’ portrayal of Chloe’s wary friendship with Nadine Ross, which I found to be the most appealing aspect of Lost Legacy. Their relationship needle swings too wildly between friend and foe at times, but by the time the curtains fell I found myself believing in their friendship and rooting for them to succeed. How nice, too, to play a video game where the bulk of the story revolves around two women working together. Lost Legacy also includes Uncharted 4’s full suite of competitive and cooperative multiplayer options, along with a new variant on the existing co-op horde mode. I played a few rounds with my editor Stephen Totilo and while Uncharted multiplayer isn’t really my cup of tea, the new mode may do more for people who’ve invested the hours it takes to rank up and unlock decent weapons. Like a lot of people, I don’t play Uncharted games for the multiplayer. I play them for the sense of escape they provide, for the feeling that I’m hanging out with charming and attractive people as they visit charming and attractive places. Uncharted: The Lost Legacy ably provided both of those things. For all that I hope Naughty Dog refines their next game, I can’t say I regret taking another scenic spin down Uncharted lane. Lost Legacy tells a winning tale of friendship set against a backdrop of gorgeous mayhem, and it might even teach you a thing or two about Indian history along the way.